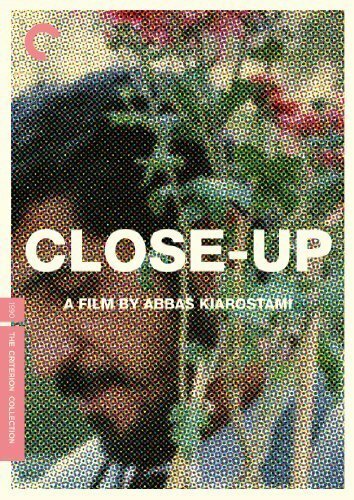 When approaching a film by the internationally acclaimed Iranian director Abbas Kiarostami, I am generally very cautious. His films are known for being very, very slow (imagine a snail in slow-motion) and generally uneventful in terms of plot (watching paint dry is more action-filled). Notwithstanding, there is a deep and profoundly affecting humanity contained within and revealed through his films that can be even life-changing. In other words, his films may be at times hard to sit through, but in the end, we are more often than not left amazed and grateful for the experience. With this cautious but hopeful mindset, I entered his 1990 movie entitled Close-Up. I decided to watch it because it is hailed and celebrated by known film-makers around the world, including Martin Scorsese and it did make the cut as one of the 50 greatest movies of all time by Sight and Sound in 2012. Up to that point, my favorite film of Kiarostami had been Taste of Cherry (1997), which had been curiously panned and even hated by renowned film critic Roger Ebert on its release although later he adopted a somewhat softer tone, while one of Kiarostami's more recent (abroad) efforts Copie Conforme (2010) had been interesting but not as impressive as his Iranian films. Yet even the latter film showed some of the director's trademarks. There are long conversations often filled with poetry taking place in a car as well as a continuous interest, if not obsession, with the blurry lines between fact and fiction, or rather cinema and fiction. The title itself Copie Conforme meaning “Certified Copy” directly references this theme; that is, the film is a copy or replicate of reality (and incidentally his latest movie is called Like Someone in Love (2012): although I have not yet seen the film, the “like” part of the title shows us that it must include the recurrent theme of reality versus appearance). But if cinema is a copy of real life (and love), it is at the same time more real than life in that it expresses a wide range of experiences that are often not visible to the naked eye of ordinary life. Indeed Kiarostami's philosophy of cinema is not as far-removed but equally dense as, for example, the opera. In fact, traditional operas from their well-known Italian masters, most notably Puccini and Verdi, often serve as a magnifying glass that enlarges life and exposes the vivid and colorful emotions and passions underneath. The opera (and Kiarostami's movies, as a rule) are rather self-conscious about these acts; the music swells and the singers / actors swoon to (over)expose human sentiment and passion, and the viewer and the composer / performers are fully aware that this is merely a stage of actors. In Kiarostami's films, there is almost always the reminder that this is a film we are watching when he deliberately exposes himself and/or his crew. The fact that the cinematic world is artificial does not, naturally, take away from its often life-affirming message about our daily lives. So it came as little surprise that Kiarostami would be interested in the real-life case of a so-called swindler or impostor who decided to pose as the famed Iranian director Mohsen Makhmalbaf and who was hence sued by the swindled family and was to be tried for his acts. Kiarostami must have loved the fact that we have here the double of impersonator versus the real director. The reason why he was (mis)taken for the director was their physical resemblance. But why would this man do something like that? What was his motivation? Money? Fame? Or both? To give us the backstory, Kiarostami got the real-life people play and re-enact what had happened beforehand, the most notable situations that led them to this endpoint. So while the trial is a documentary work in that it documents the conversations plus reactions and decisions of all involved, it is also a film since the director is not only present throughout with two cameras and his minimal crew, but he even directs events by directing questions to the accused and by also providing the occasional commentary to all involved in the court case. In the meantime, the filmed and “artificial” scenes of the past are a visual representation of how everything had occurred giving us a better understanding of the proceedings, the trial itself and its subsequent verdict. Since they were shot with the original people acting as themselves, the movie is further blurring the lines between documentary and fiction. The judge, who was asked permission to film his trial, looked at first baffled regarding the request. Why, there are more interesting and dramatic cases than this one, he insists. There are cases of homicides and other more serious crimes, and the judge believes that they would be more deserving and fitting to cinematic aspirations and exposure than a simple case of fraud, but none of those cases are of interest to the director. Then ensues one of the most thrilling court dramas I have seen. This is not Matlock or any of the suspenseful Hollywood films nor is it the widely celebrated but in comparison much inferior A Separation (2011) by another talented Iranian director Asghar Farhadi. This is the real case of an enigmatic poor man named Sabzian who could possibly face a prison sentence for his actions involving a well-to-do family. Slowly, we see his motivations come to light, and the way it happens, I was reminded of Sidney Lumet's brilliant examination of jury proceedings behind closed doors in his seminal 12 Angry Men (1957). In fact, the accused did not mean to cause harm nor to rob the family as they believe, but it started with a misunderstanding. We are shown a flashback, which was evidently shot after the event with the real participants, in which Sabzian is sitting in a bus reading the screenplay of Makhmalbaf's The Cyclist (1987). The passenger beside him is a woman, in fact, the mother of the well-to-do family Ahankhah who asks him about the book, and Sabzian eventually and rather impulsively claims that he is the director himself. The woman impressed with sitting next to the famous and respected director asks him a number of questions, including why he is taking public transport, and somehow Sabzian has an appropriate answer to all her questions. As a humble director, he is a man of the people and, in fact, he is also scouting for possible subjects and actors for his upcoming movies, Sabzian channeling his idol Makhmalbaf explains. Taking into account his physical resemblance, his eloquence and his thorough knowledge of the director's oeuvre, the woman is not only convinced of his identity, but also intrigued and says that she would like her sons to meet him. He complies and considers that he might even put them in his next film, and she gladly gives him her address. Why did he impersonate the director? A possible answer is that he essentially and existentially identifies himself with that man's works. Sabzian claims that the movies Makhmalbaf has made are about poor and ordinary people like himself, that he had watched them various times and that he constantly saw himself and his life with its sorrows and suffering reflected there on the screen. At the same time, because of his physical resemblance, he had also in the past pretended to be the director because he was suddenly given respect, which he generally lacked in his real life. In his day-to-day life, he saw himself as a penniless and insignificant person, but when he assumed the identity of the director people's view of him suddenly changed. What he said and thought suddenly mattered, and in fact, they even followed his instructions. At one point, he asked one of the family members to lend him some money, which he then purportedly used to buy something for his son. He adds that a famous director like Makhmalbaf, the role he was playing could not be possibly poor. His personal life was also nothing special. He was a devout person, but his wife had divorced him. His mother is present at the hearings pleading for the good nature of his son claiming that he did not put up a fight against the divorce and fully accepted his wife's decision. He had no intention of robbing the family of their money and that he had fully intended to pay the son back the money lent to him. The judge also seemed quite sympathetic (opposite to how Muslim clerics are often portrayed in Western media) towards the accused and his mother; he immediately dismissed the accusation of intended burglary; the family had thought that he wanted them to come out (to lure them out) and see one of “his” (meaning Makhmalbaf's) movies in order to steal all the belongings from their house. This was immediately dismissed by the judge as implausible and unfounded. In fact, after listening to all participants, the judge put the ball back into the family's court claiming that it was up to them; if they wanted to drop the charges, he would fully comply and that in the eyes of the court, this man was misguided in his actions, but had not meant to do any harm. The family agreed and said that they would do so should the man accept his faults and apologize for his actions. Two scenes of this movie are some of the most moving I have ever seen on the screen. One is when the director is examining Sabzian's desires of being a director; the man claims that he merely wanted somebody to tell the world the story of his life. Then Kiarostami retorted, so you want to be an actor not a director and the proof there was the fact that he was acting as a director and had done so successfully. Yes, Sabzian said under tears. He wanted people to know of his real suffering, to expose himself the way he is inside to the world outside, and that they see him not as a swindler but as a feeling and tender man. His dream would be to have a role playing himself, the way he is deep inside. Well, claims Kiarostami, is this not exactly what you are doing right now, and a teary-eyed Sabzian suddenly realizes that he has just done so in front of the camera. The second moment is at the end of the movie when Sabzian comes face-to-face with the real Makhmalbaf, and he cries. Makhmalbaf consoles him and gets on Sabzian's motorcycle to go to the family's house for a surprise visit. On the way, there are issues with the sound and we hear Kiarostami's concerns that we cannot at times hear their conversation. Is that scene mere acting and pretending on the part of the director to make it seem more realistic and documentary-like or was there indeed a technical problem while shooting? Considering the fact that they cannot re-shoot a documentary scene, this could be the latter case. But Kiarostami instead gives us glimpses of their motorcycle ride with added soundtrack. Finally, they get to the door of the family who will come to meet both at the same time, the real life director and his well-meaning impostor, the real and the fake, the true and its copy. And the film ends with a wonderful freeze frame on Sabzian's face holding a flower as a sign and gift of reconciliation. This might have also been a nod to Makhmalbaf's own The Cyclist, which also ends on a freeze frame of the main character, a film that was also highly respected by Sabzian. Now as a final question, I would like to consider the following: Did Sabzian not put on a double act? In fact, he is good at acting and making the family believe he is the director, but did he not play with us and make us believe that he is a good and innocent man? Did he not put on a show for us the viewers? Or was his performance real, as he himself claims? Is the movie real? If so, to what extent? Is it a documentary or is it a film? Does the trial not become a work of fiction due to the presence of the camera? Does the director not have too much say and control and hence, is he not changing the court proceedings to his own favor? Would Sabzian have been acquitted without Kiarostami's presence and interference? One thing that is for sure is that this movie not only made me think, but it also made me rethink the work of this brilliant Iranian director. This was not only thoughtful and moving but also a thrilling and entertaining experience. No wonder it is considered one of the best movies of all time because, in reality, it fully merits its mention on that list.